We are excited to invite you to an evening of Nepalese immersion and celebration at The Hungry Buddha, Curtin, on Thursday 16 June from 6.30pm – 9.30pm! Tickets are $50 (plus Eventbrite’s fee). All money raised will be used in the Mahakulung region of Eastern Nepal (ie not on plane tickets, film equipment). This is an opportunity to connect with the local community and help the Kulung people of Eastern Nepal. During our climb, we will stay in local teahouses (guesthouses), hire local porters and guides at fair wages and purchase meals and supplies in local villages, which in turn, will provide an income and much-needed investment for these communities. All money raised on this evening will go straight into the pockets of the local communities we visit. Because the region does not sit along the main tourist trail, the benefits will be a real contribution to the lives of the Kulung people. 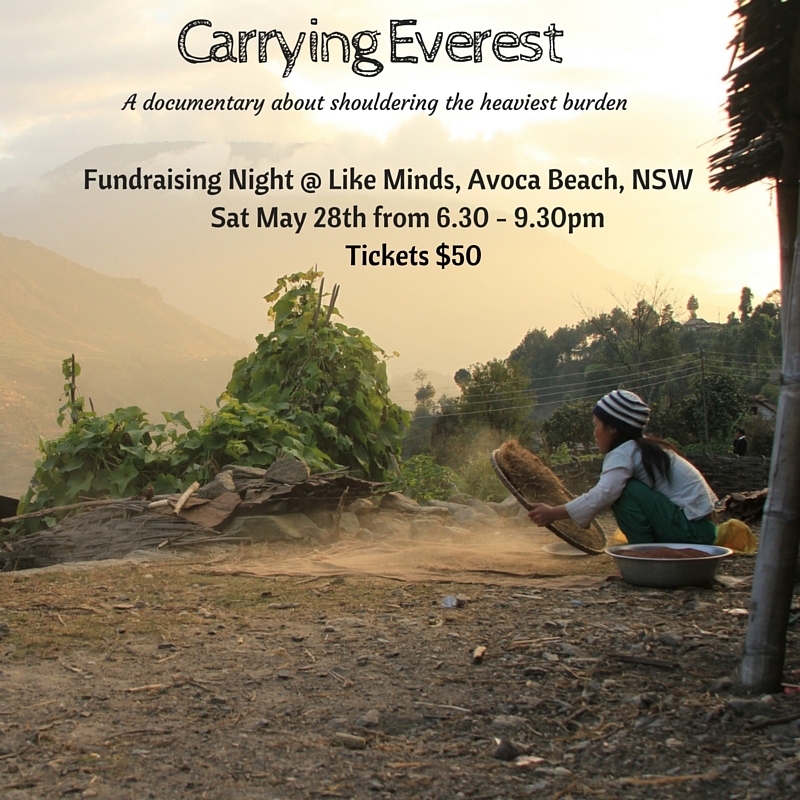 We are excited to invite you to an evening of Nepalese immersion and celebration at Like Minds at Avoca Beach, NSW on Saturday May 28th from 6.30pm – 9.30pm! Like Minds is a simple coffee shop with a mindful menu, community space and vegetable garden located at Avoca Beach next to the lake on the Central Coast of NSW (about 1 hour and 20 mins north of Sydney and 1 hour south of Newcastle). The owners believe in making the local community and the world a more connected and beautiful place, and support projects and initiatives that aim to do the same. While there are countless tales telling of conquest over the world’s tallest mountain, the stories of those who make it possible for 30,000 tourists to visit the region each year are more often than not forgotten. Exploitation of their cheap labour and desperation. Carrying up to 95 kilograms, porters are only paid approximately AUD$12 a day. After paying for their own meals and lodging, porters might only take AUD$74 home to their families after a 13-day trek. Geographic isolation far away from the main tourist region of Nepal. It takes two full days to reach the Mahakulung region by foot. Despite being among the most marginalised people in the world, the Kulung are courageous, humble and incredibly gifted. Our film is an attempt to share the stories of the Kulung to the wider world – to provide an insight into their lives, their thoughts and dreams. Via this film, we hope to create an interest in their cause and hopefully encourage further development and tourism in the area. The 2015 earthquakes has led to the significant loss of homes in the Mahakulung region where the Kulung reside, compounding the issues and making it even more important to create this film and tell the stories of the Kulung. Join us on May 28th to help us tell the stories of the Kulung!